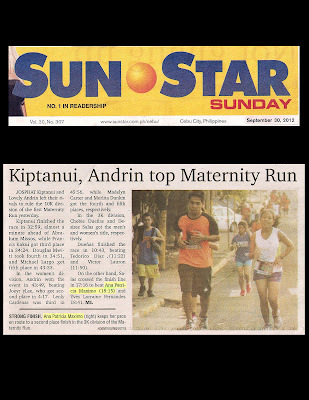 JOSPHAT Kiptanui and Lovely Andrin left their rivals to rule the 10K division of the first Maternity Run yesterday. Kiptanui finished the race in 32:59, almost a minute ahead of Abraham Missos, while Francis Kakui got third place in 34:24. Douglas Mwiti took fourth in 34:51, and Michael Largo got fifth place in 43:33. In the women's division, Andrin won the event in 43:49, beating Joeyry Lee, who got second place in 4:17. Lenly Cardenas was third in 45:56, while Madelyn Carter and Merlita Dunkin got the fourth and fifth places, respectively. In the 3K division, Chobie Duenas and Desiree Salas got the men's and women's title, respectively. Duenas finished the race in 10:43, beating Teodorico Diaz (11:22) and Victor Lauron (11:50).